The Cincinnati Rollergirls open their third home season at Schmidt Memorial Fieldhouse at Xavier University this Saturday, March 23 with their annual Fan Appreciation Night — and they’ll be counting on the cheers of CRG’s loyal flock to carry them to victory against a higher-ranked opponent. CRG’s Black Sheep, currently ranked 88th by the Women’s Flat Track Derby Association, will battle No. 80-ranked Brandywine Roller Derby in sanctioned play in the first game of Saturday’s double-header. These two teams last faced just over five years ago, with Brandywine taking the win in sanctioned play, 217-104. Brandywine finished 2018 season with a 5-5 record, but this will be their first sanctioned game of 2019. CRG finished the 2018 season with a 6-2 record and booked an aggressive 10-game home and away schedule this year in the hopes of averaging out to a higher ranking by the time the season is said and done. So far, the Black Sheep are 0-3 on the season after three tough losses against higher-ranked opponents: Gem City (Dayton) in a closed game at home and the Oklahoma Victory Dolls and Columbia Quad Squad at the March Badness tournament in Columbia, South Carolina. For Saturday’s home season opener, the Black Sheep will be bolstered by a solid group of CRG veterans, including Nuk’em, who missed CRG’s 2018 season. 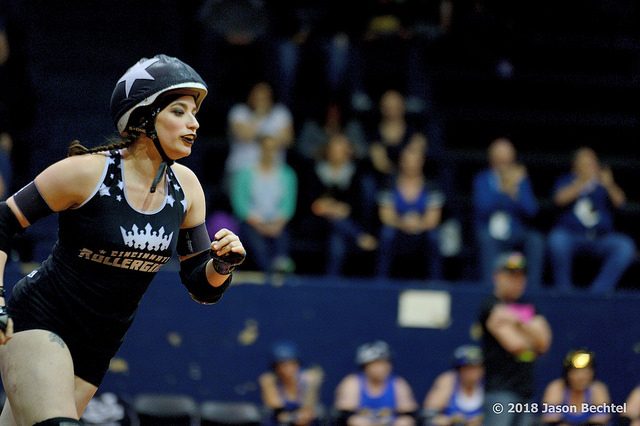 Formerly best known as one of CRG’s hardest-hitting blockers, look for her in the jammer rotation this Saturday. Also likely to be wearing the star for the Sheep is up-and-coming jammer Loko (pictured), who was a standout on CRG’s B team, the Violent Lambs, last season. Saturday’s Violent Lambs roster includes many skaters who are also rostered for the Sheep, plus two will be making their CRG debuts, Motley Crouton and Ursa Maimher. Gnarly Manson will also be making her return track after missing the 2018 season. Finally, Sailor Scary, usually a fixture on the Black Sheep roster, will be skating for the Lambs on Saturday after recently returning to play from an off-season injury. And if these competitive matchups aren’t enough reason to come out and cheer for CRG on Saturday, the team is giving away free fanny packs to the first 50 fans in the door. Plus, fans can count on the usual refreshing fare of local craft beer, food from the Hungry Bros. food truck and Delicio Coal Fired Pizza, also this year’s after-party sponsor. Bring your appetites and your loudest CRG cheers. When: Doors open at 5 p.m. CRG’s Black Sheep play the Brandywine Belligerents at 6 p.m. and CRG’s Violent Lambs play the Brandywine Brawlers at approximately 8 p.m.